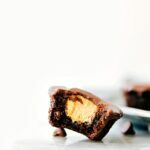 Easy miniature “peanut butter cup” brownie bites. Creamy peanut butter filling in a chocolate fudge brownie bite covered in a soft chocolate ganache. Oh HEY desserts! It’s been a while! We’ve been chugging along on all the healthy eats and eating ALL the healthy quinoa tacos. But with all things, moderation is good, and these are just the way to ease back into some sweet treats. Okay “easing” may not be the right word when you eat a whole pan in one day. ? BUT. They are miniature, so it’s all good right?! And these little guys are perfect for the big Game Day coming up! I’ve got a few recipes to share (including the taquitos I already shared!) to gear you up for the Big Game! So why are these perfect for game day? ✔️ TASTE: they are so delicious! I mean it’s peanut butter + chocolate — how could you go wrong?! Sure to be a crowd pleaser! ✔️ TRANSPORTABILITY: this may seem like an odd reason, but it’s important for us! We’ve never hosted a game day party, but we’ve gone to them. So if you are going to one and bringing some treats, you don’t want them to be impossible to take (or stressed the whole time you are driving somewhere that they are going to get ruined). These transport great! You could even pop them back into the muffin tin for traveling. ✔️ EASE: these are SO simple to make. Especially because they start with a BROWNIE MIX! (You all know my obsession with brownie mixes by now right?!). 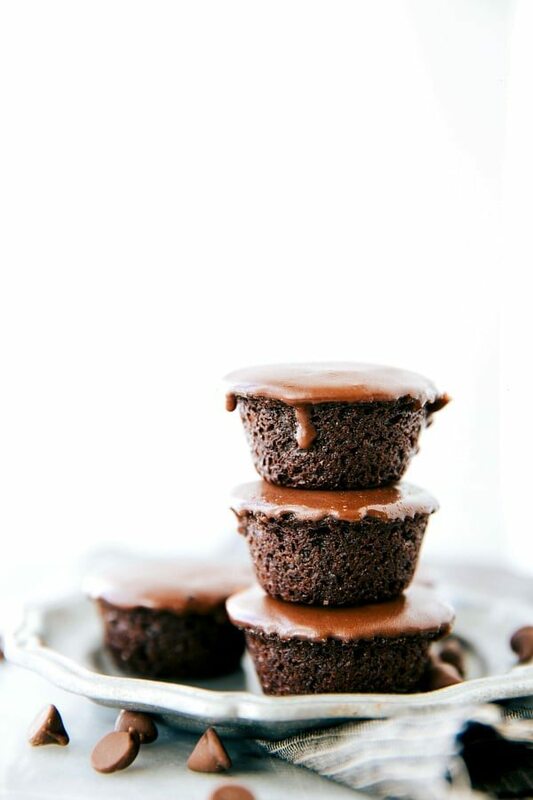 They use a Chocolate Fudge Brownie mix by Pillsbury making the base of these so quick and easy. Plus pretty guaranteed fool-proof results which is one of the huge reasons I love brownie mixes. And the ingredients are totally “normal” (no crazy wild goose-chasing to find random ingredients). ✔️ FUN TO MAKE: annnnd this may just apply to baking fanatics (?????? ), but these really are fun to make. The steps are simple and nothing too intense here. No stovetop chocolate melting of chocolate (hi microwave!) and no stand mixers needed. The toddler loves making these with me. He gets super excited every single time we add eggs to anything because “egg” is one of his favorite words to say. And he’s completely obsessed with eating eggs — scrambled, over easy, omelette, frittata… you name it! If it has eggs in it he’ll devour it. That also goes for desserts with eggs mixed in… ? He loves watching the egg disappear into the batter and then he instantly wants to eat the batter. That’s definitely the hardest thing for him with this dessert– the waiting game. As soon as they are baked, filled with peanut butter, and covered in chocolate (if he even makes it to that step…) he’s one happy camper! Fill up each muffin cavity 2/3rds the way full. Bake for 18-21 minutes being careful to not over-bake. Remove from the oven and push a 1/2 teaspoon measuring spoon into the center of the brownies. Allow to slightly cool and then gently twist the brownie and pull out. Allow to completely cool. 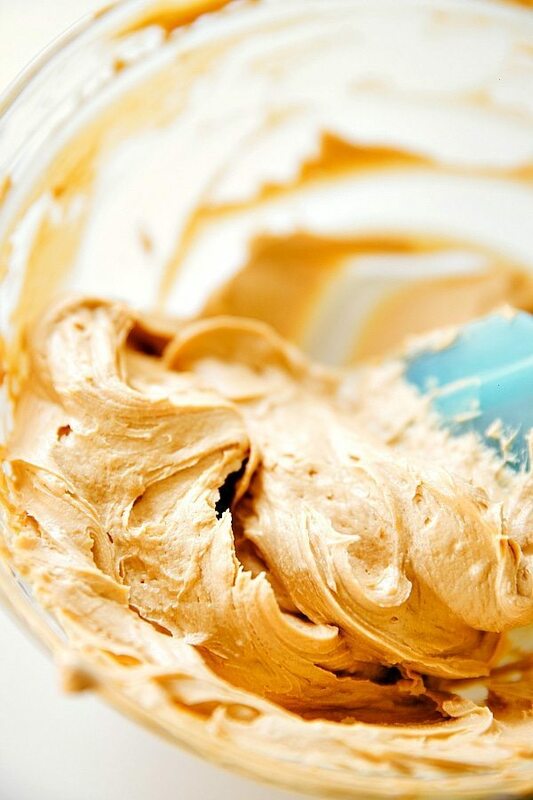 In a bowl, beat together the peanut butter and ROOM temperature (do not melt or soften) butter until creamy. Add in the powdered sugar and vanilla extract. Add powdered sugar to your desired thickness (I like a "lighter" less dense peanut butter filling.) Add a pinch of salt if your peanut butter is unsalted. 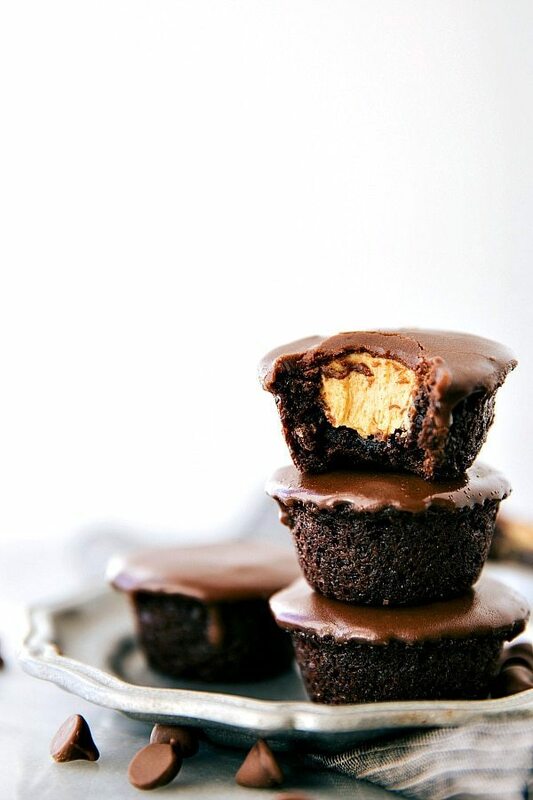 Fill up the completely cooled brownie cups evenly with the peanut butter filling. Use a knife to scrape the top so it is even. Cube the butter into small cubes. In a microwave safe bowl, combine the milk chocolate chips and the butter cubes. Melt in the microwave in 15 second bursts, stirring in between each burst for at least 15 seconds until the chocolate is completely melted and smooth. Allow to completely set up. **I tried just about EVERYTHING to find the easiest way to get these brownies to come out cleanly. Muffin liners do not work, plain cooking spray and flour doesn't work.... The best solution was to rub shortening into each cavity and then lightly dust with cocoa powder (flour will work with the shortening, it just will make the brownies have a white-ish color). With shortening, these come out SO clean and easy. Do not skip this. And here I thought peanut butter cups couldn’t get any better! Chelsea these are stunning & looks so delicious! Pinning!! Have a great relaxing weekend girl!! I made these over the weekend and they turned out so good! I set the oven temperature to 325 and baked for around 17 minutes, though – no need for liners, shortening or cocoa powder. Simple cooking spray worked and they popped out like a charm! 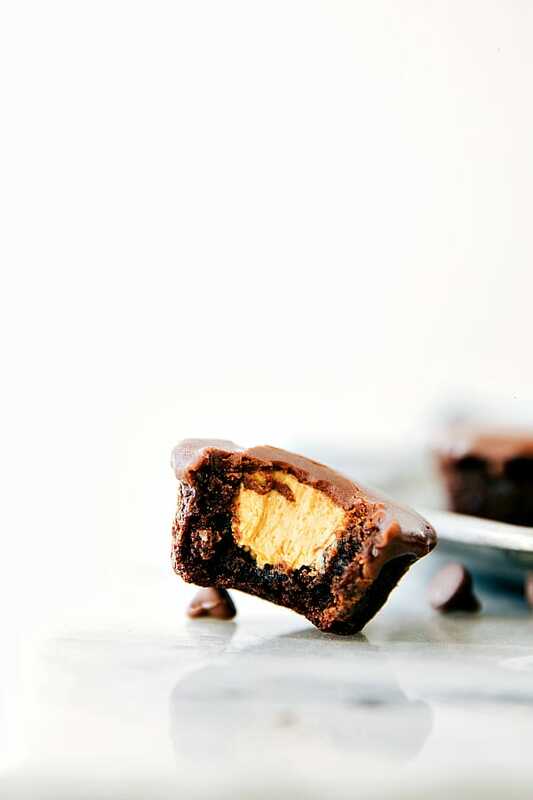 HOLY MOLY-the brownie bites look so dense and chewy, the pb filling looks downright luscious, and that ganache!! You’ve outdone yourself! I made these for my son’s preschool holiday party. I took the advice to cook them at a lower temp and didn’t have any trouble getting the brownies out. I prepped the tin with butter and cocoa dusting. According to the teacher these were a huge hit and the kids were trying to “get at the leftovers”. My husband and I enjoyed them as well! Can you put someplace on your recipe page so I can email to myself? I don’t have a working printer, so I email recipes and save them in a folder. Really want to make this one.